To avoid any confusion and ensure that each buyer has their choice pick in each of my litters, I will establish a pick up date and time well in advance to accommodate my buyers. To assist you making your pick, I will update my website with current photos and which puppies have already been picked. For those who cannot be here in their allotted time, you will be required to pick from the photos. Please keep in mind that the next people waiting in line are just as excited as you are to pick and get their puppy. It is my desire that each puppy choice is handled in a smooth and convenient manner and that every step of the process if fair to everyone. CASH payment in full is required at time of pickup. If puppies are shipping full payment is due between 6 and 7 weeks through PayPal. *Your puppy will have their dew-claws removed when they are 24 hours to 5 days old. We give worming meds at 3, 5 and 6 weeks. The vet will listen to their hearts, check joints, eyes, ears and check for parasites. Then they will be given their first set of shots at 6 weeks. The average weight of a 6 week old puppy is 6-9 lbs depending on litter size. 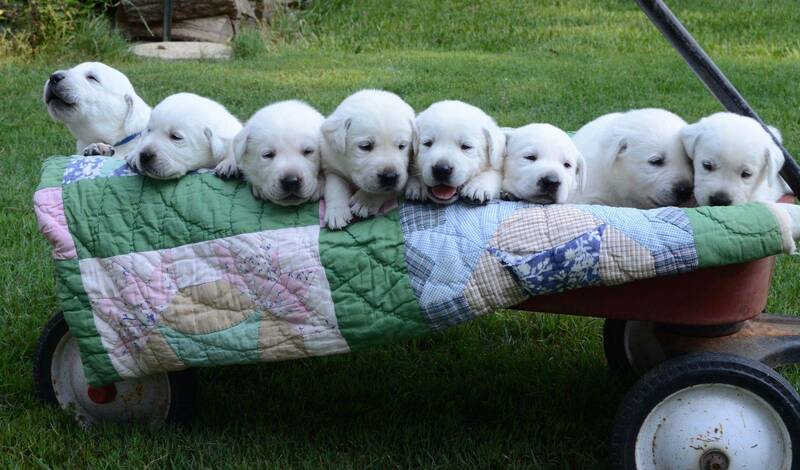 The smaller the litter, the bigger the puppy. When born they weigh around 1 pound, and gain on average 1 pound a week. This in no way reflects on how big your puppy will grow to be. That will depend on the parents size. They will need 3 more sets of shots 3 weeks apart. Your puppy is not protected until their final shot. You will need to limit where you take your puppy until all shots are given. *Your puppy at 6 weeks will get a microchip. I will register the puppy in your name with AKC reunite. * When you come to pick up the puppy bring an old towel that way the baby can take home the scent of their mother. * It will be hard but try and limit your small children from holding and moving them around all the time. At least the first few days. Let them settle in a little bit. * I like to crate train my puppies. You can buy a medium to large wire crate. The wire crates come with a divider so you can make them smaller and increase the size as your puppy grows without having to buy several different plastic ones. It's best to have it big enough for them to move around a little and lay down. If it is to big, they tend to not hold it when they need to go potty. *If you want to get a collar small will be a good size to start out. *I like to go to Goodwill and get stuffed animals for them when they are smaller. They like to sleep and play with them. No need to spend big money for "dog" toys. *Instead spend your money on lots of bones. Get tons of bones!!!! Labs love to chew! They are working dogs. They like to have things to do and can get into trouble if left alone. I get them a lot of different toys, balls and chew bones. Then I like to change them out. I think like kids they get bored if they have access to everything all the time. I always tell everyone the first year is hard. They are very smart, stubborn and full of energy, but after that they will be the best dog you've every had. They are also very loyal and protective. My first lab would sit between me and any person she didn't trust. If I moved, she moved. It was kinda funny when I realized what she was doing. But I definitely liked it. *Most labs have the drive to work. That's what they have been breed to do. They like to retrieve and to please, but they can also be stubborn. I think it's because they are so smart they just think they know best lol. But what is most important is the time and training you are willing to put into them. *We do all we can here to get them prepared for their life with you. *We introduce them to soften puppy food between 3 and 4 weeks. By the time they are ready for their new homes they will be on hard puppy food. I'm feeding Iams Large breed puppy. At 6 weeks they need to eat 2 a day. Follow the recommended feeding amount on the bag. If you want to change to a different food you need to change it slowly to not upset their tummies. I think it would be best to wait at least a week for them to settle into their new homes before you start the process of changing their food.